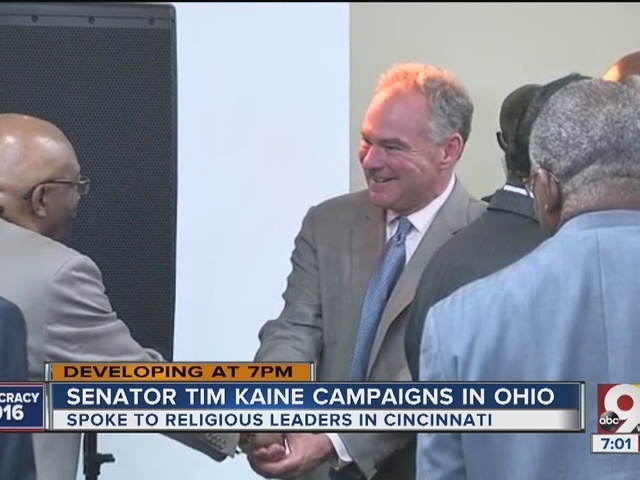 CINCINNATI -- Democratic vice presidential candidate Sen. Tim Kaine made a visit to a Cincinnati church Monday afternoon, touting his civil rights credentials to a black religious and community leaders in remarks before a roundtable discussion that was closed to the media. 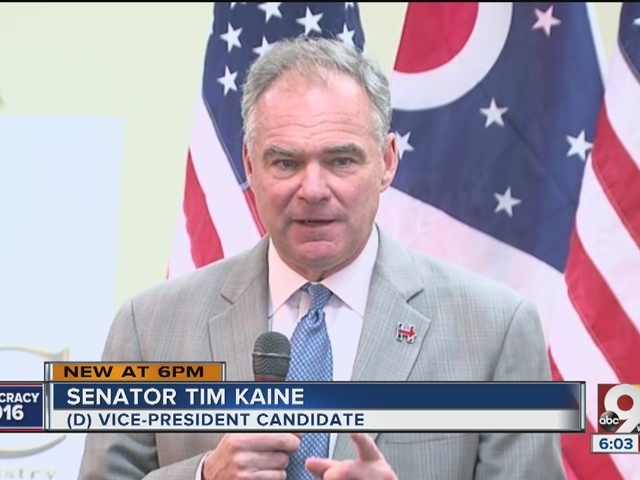 Kaine was in southwest Ohio for an announced campaign stop at Stivers School for the Arts in Dayton, where he told reporters the first time he and Hillary Clinton spoke about her health was on Sunday by email, days after her pneumonia diagnosis on Friday. He said only that he knew since early last week that Clinton was coughing and not feeling well. But Kaine wouldn't discuss specific communication with his running mate beyond the Sunday emails. Kaine said he and Clinton don't speak every day but have frequent contact and usually don't go longer than two days without communicating. He said he didn't think Clinton's health problems shined a brighter spotlight on his possible ability to be president in her place, saying her "energy staggers" him. Kaine said he contacted Clinton to check on her health over the weekend and she immediately responded, "I'm going to be fine." Clinton fell ill during a 9/11 memorial event Sunday and was videotaped struggling to get into a van. 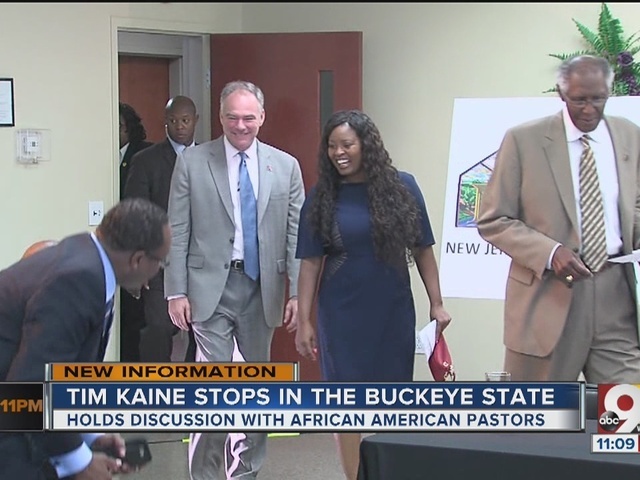 Kaine didn't address Clinton's health in his remarks at Cincinnati's New Jerusalem Baptist Church, though the pastor, Rev. Damon Lynch Jr., prayed for her recovery. Instead, Kaine highlighted his civil rights work as the mayor of Richmond and governor of Virginia; he said he was one of the first to endorse then-Sen. Barack Obama in his presidential bid, during a lengthy Democratic primary eight years ago against Clinton. He also worked to contrast his and Clinton's campaign with Republican presidential candidate Donald Trump's; on foreign policy, he said: "I don't think we're going to be safe by building walls and shredding alliances." Kaine acknowledged the man he described as Virginia's most preeminent politician, Thomas Jefferson, owned slaves. But he said the United States should be guided by the "north star" of equality idealized at the nation's founding. The Clinton and Trump campaigns, as expected, have been frequent visitors to Ohio in recent weeks, hoping to win the state's 18 electoral votes in November. The latest Ipsos poll placed Clinton ahead by 2 points, while the RealClearPolitics average of polls has Clinton up by 3 points here.